Today in particular we’ll be talking about one of the major recurring elements of FMA: ‘equivalent exchange’. As someone who’s exposure to FMA is mostly from the original anime series the concept of equivalent exchange as the fundamental rule of alchemy and ‘the world’s one and only truth’ cropped up pretty much all the time. It’s a rule in two parts: you can’t get something for nothing and the corollary that if you put in something, you really shouldn’t get nothing. Throughout the story the Elric brothers constantly test the limits of this axiom. Hachiken of Silver Spoon is, in a way, also doing to same, though perhaps not as explicitly. 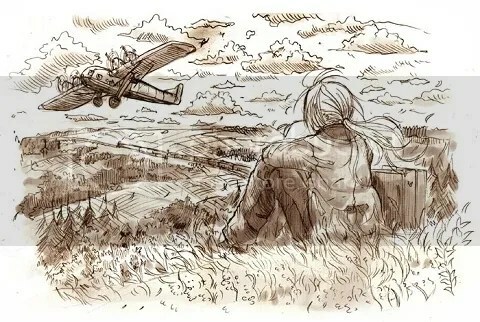 Both Silver Spoon and FMA are at their roots coming of age stories, with the protagonists of both series struggling with challenges to their belief systems and redefining their world view. The difference, I suppose, is that instead of trying to resurrect his dead mother via abominable sins against man and nature, Hachiken makes pizza. And that’s almost the same thing. The pizza making story is great because it is a culmination of all of Hachiken’s efforts, the help of his colleagues and the fruits of the farm to create something that was tangible and worthwhile. It is evident that previously in his life Hachiken tried very hard at academics with nothing coming out of it, ‘held hostage by the idea that he needs to make something of himself’. 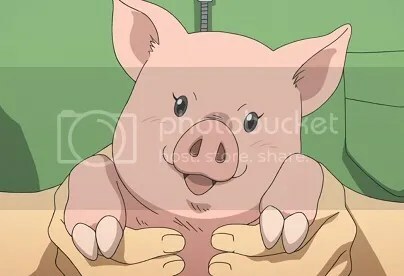 The two obvious metaphors are the piglet Pork Bowl and the horse Mikagehomare: Pork Bowl loses the first fight for prime milk position and stops trying, while Mikagehomare tries very hard but is still going to become glue if it loses the race. 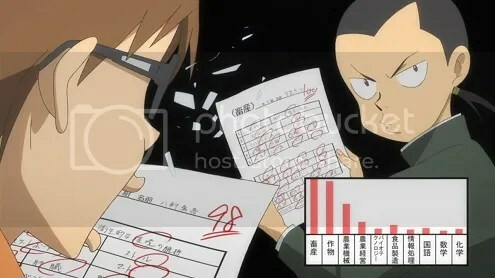 Hachiken is obsessed with being first in his class because in our go big or go home society mediocrity is just wasted energy. The curse of the generalist is to be upstaged at everything. Of course in making the pizza Hachiken also needed to come to terms with where his food comes from. 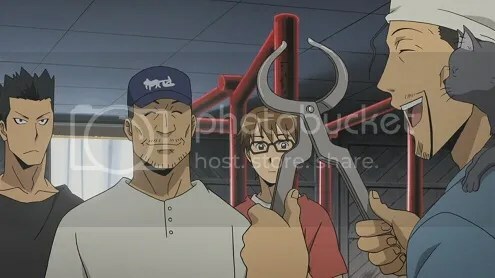 One day Pork Bowl will become bacon and Hachiken will need to decide whether he wants to be vegetarian. Until then Silver Spoon is keen to remind us that there is no altruistic relationship on the farm; the domesticated animals are resources, not pets. While farm animals may receive better care and conditions than their wild counterparts, it is at the cost of their complete subservience to human needs. Now I’m sure there are plenty of burning ethical questions about agriculture that be debated until the proverbial cows come home, but let’s not wander too far into those flammable territories. The point, I think, is that Silver Spoon is trying to keep a realist edge on what would otherwise be a rather idealistic story. And that’s what the transition from teenage to adulthood is somewhat about–the balancing act between the optimistic idealist inside and the cynical realist. The child wants to be a vet because he or she just likes animals. The adult understands that when you’re an animal doctor sometimes your hands will get dirty. For all the aspiring ag vets out there: the fastest way to fix a bloated cow is still to stake them. They’re tasty sirloin vampires. Last time I talked about Silver Spoon being about the dreams. We also have the flip. There is not much worth doing that doesn’t take a proportional amount of work. Even then, putting in all the work is sometimes not enough. While a lot of anime targeting the typical high school audience will deal with the dreams vs hard reality dilemma, more often the message will just be, ‘Hell yeah, go for it!’. 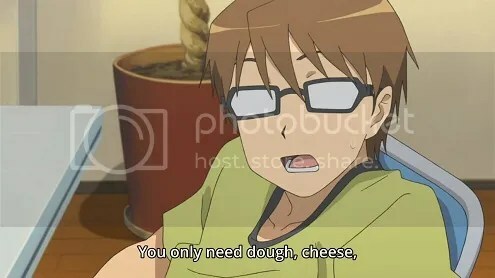 It’s interesting to see some introspection in Silver Spoon.